My colleague Eckhard sent me these pictures from Hamburg, Germany. 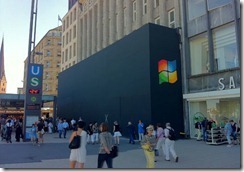 It is of the construction of a new retail store on the main shopping street in Hamburg. 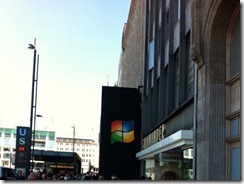 You might think that it would be a new Microsoft store, but you would be wrong. 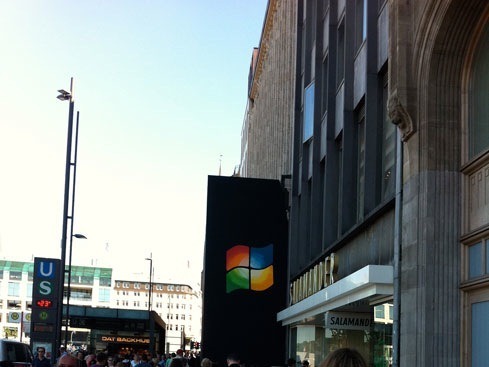 Look carefully at the “Windows” logo. What’s wrong with it? Are the blue and green squares in the right place? Why no, they’re not! It turns out this is of the new Apple Store. Nice to see someone in a large corporate marketing department has a sense of humor. Good one, Apple!